This gets confusing, especially with other designations like National Parks, National Monuments, National Natural Landmarks, and National Historic Places. All of these are listed by the U.S. Department of the Interior and National Park Service. Here is the official definition of the National Historic Landmarks Program. "National Historic Landmarks are nationally significant historic places designated by the Secretary of the Interior because they possess exceptional value or quality in illustrating or interpreting the heritage of the United States. Today, fewer than 2,500 historic places bear this national distinction. Working with citizens throughout the nation, the National Historic Landmarks Program draws upon the expertise of National Park Service staff who work to nominate new landmarks and provide assistance to existing landmarks." There are eight National Historic Landmarks in the state of Nevada (as of January 2013). Almost all of these are in northern Nevada, and one is right in Reno. These significant landmarks span literally thousands of years of Nevada and Great Basin history. With each listing is the county in which it is located and the date of landmark designation. If you are interested in learning more and visiting other historic places in the west and across the United States, the National Park Service website "Discover Our Shared Heritage Travel Itinerary Series" is a good place to start. Carson City - October 16, 2012. The McKeen Motor Car entered service as No. 22 on the Virginia & Truckee Railroad in 1910 and was retired in 1945. It was one of the first self-propelled railcars used on American railroads. It went through several owners and uses after its time with the V & T, but never left the Carson City area. Washoe County, May 23, 1963. Francis G. Newlands served as a U.S. Congressman from Nevada from 1893 to 1903, and as a U.S. Senator from 1903 until his death in 1917. Newlands' greater historical significance was as the primary author of the Reclamation Act of 1902, which created irrigation projects enabling agriculture in the arid American West. Virginia City National Historic Landmark is the largest federally designated historic district in the United States. Together with the surrounding Comstock mining area, it is included in the Virginia City Historic District. The story began with the discovery of the Comstock Lode in 1859, which proved to be one of the richest ore finds in history. Virginia City boomed for many years longer than the average mining town of the era, eventually producing millions (billions in today's dollars) in gold and silver. The inevitable decline began in the 1890's and was followed by decades of scant population and slow decay, though it did not become a ghost town like so many other mining towns. Today, many of the historic buildings, cemeteries, and old mining works have been preserved throughout the historic district, making for an educational and entertaining place to visit. You'll enjoy walking the wooden sidewalks and exploring the stores, restaurants, and saloons that make up this bustling little town. Numerous quirky events and activities throughout the year take advantage of Virginia City's notoriety. If you have never been, check out these Virginia City pictures for a taste of the Comstock. White Pine County - November 5, 1961. Fort Ruby is from the same era as Fort Churchill. It was established to protect immigrants and the Overland Mail Route from Indians. It was established in 1862 and abandoned in 1869 after hostilities with the original residents ceased to be a major concern. The site, at the south end of the Ruby Valley on the east side of the Ruby Mountains, was in the middle of nowhere at the time and is still extremely remote today. Clark County, Nevada and Mohave County, Arizona - August 8, 1985. Hoover Dam, located 30 miles southeast of Las Vegas on U.S. 93, is an American icon recognized around the world. The dam straddles Black Canyon and backs up the Colorado River, forming the Lake Mead reservoir. Hoover Dam was a major public works project built by the U.S. Bureau of Reclamation during the Great Depression. It was dedicated by President Franklin D. Roosevelt in 1935. 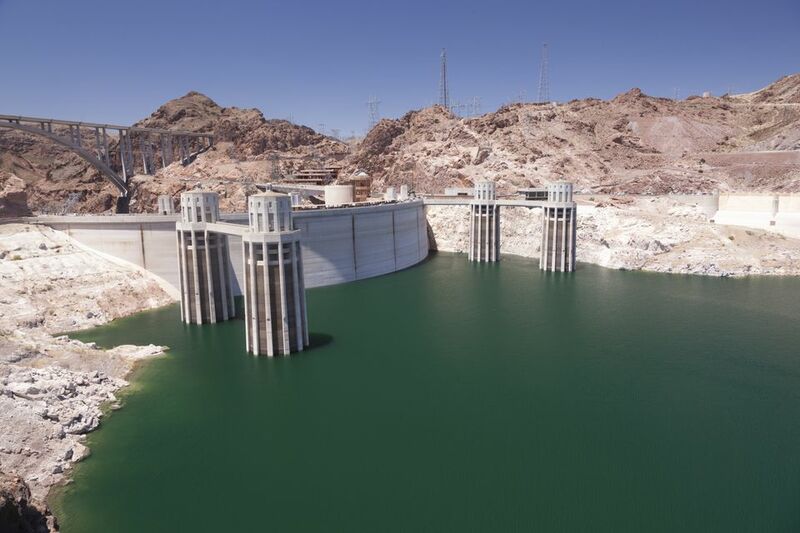 Lake Mead water and the hydroelectric power produced at the dam have fostered the southwest population explosion in places like Las Vegas and Phoenix, Arizona. Hoover Dam is a major tourist attraction that draws over a million visitors a year. If you are in the area, it is well worth seeing. For more information, refer to the U.S. Bureau of Reclamation Hoover Dam website. White Pine County, September 20, 2006. The Nevada Northern Railway is one of the most outstanding operating railroad museums in the United States. It preserves the history of a railroad that (like many others in Nevada) was built because of mining. Who Are the Wealthiest People in Nevada?